We ate at some beautiful places during our stay in Edinburgh. As we were staying at a B&B it was a great opportunity to get out and try some of the best eats that Edinburgh had to offer. Our of my favorite places we went was Fishers in the City. Fishers was highly anticipated – Josh had talked it up for ages beforehand as he had been before and really enjoyed it. Fishers is a seafood restaurant by nature – and I’m not a massive fan of seafood but I really enjoyed my visit. 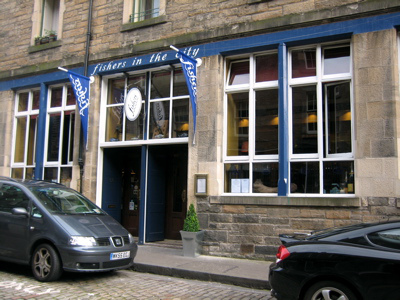 This charming restaurant was situated down Thistle Street – one of Edinburgh’s many cobbled backstreets. Photo courtesy of An American In London who visited in 2007 and really enjoyed her trip too! You can view her post on Edinburgh here if you like although I’m not sure her blog is active anymore – it’s a shame because I really like going through her old posts! Fisher’s was everything I expected and more. The fish was really really fresh – as in it was probably swimming around the previous evening. The menu we ordered from is conveniently featured on their website so if you want you can check it out here. For starters Josh and I shared the Fishcakes. Now I’m not sure what type of fish were in these – I forgot to ask! But the crispy bread crumbed casing hid a soft squishy filling of white fish and some flaked pieces of salmon. 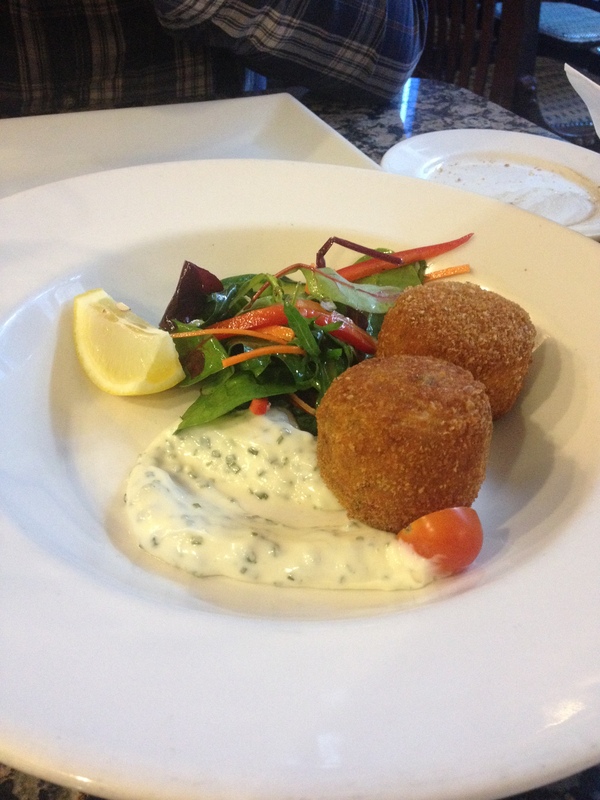 It was served with lemon and chive mayonnaise, a lemon wedge and side salad with a house dressing. Me and Josh decided to share this starter because we knew the mains were quite big. It was delicious and the filling was really meaty. One each was the perfect amount for us. For main course I ordered the “Standard Fish and Chips” even though there was nothing Standard about it! It was described as “two battered fillets with hand cut chips & tartare sauce” and I opted for the haddock option instead of cod. The chips were big chunky chips, really flavorful and not overly fried or greasy. The fish was fantastic. You could tell that it was really fresh – and I don’t know a thing about fish! But the flavor and texture was so different to what I’ve had before. It didn’t have an overly fishy flavor as such and was flaky and meaty in texture rather than the slightly dried out texture that you get with supermarket frozen fish. This meal did defeat me a bit because two fillets plus a LOT of potato was too much for this tiny tummy – but it was great! 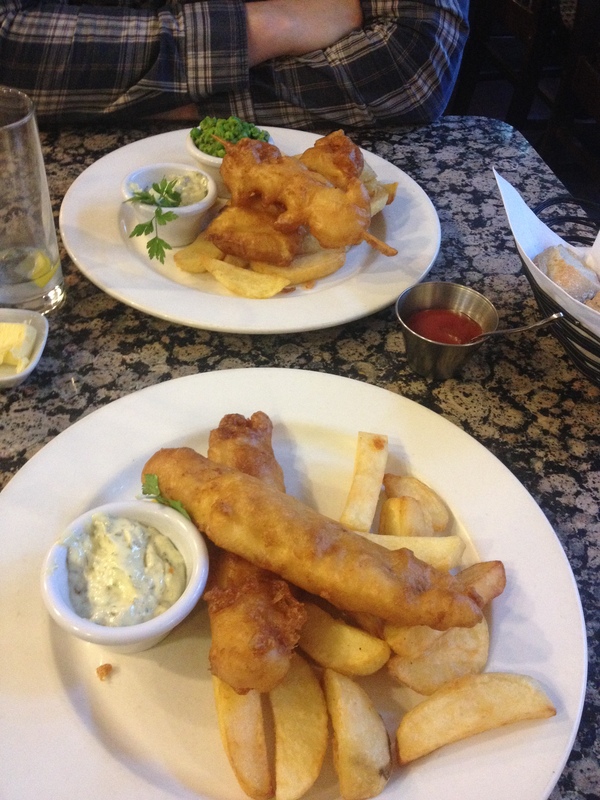 Josh had the “Deluxe Fish and Chips”. This suited and booted version of the fish and chips was described as “one battered fillet & battered King Prawns with hand cut chips & tartare sauce” and Josh opted for Cod instead of the haddock option and added some of their homemade minted peas. He really enjoyed his cod and and let me try one of his king prawns (which looked really impressive battered on their skewer!). Now I mentioned earlier that I’m not the biggest seafood fan. One thing I haven’t always liked – but really want to like! – is prawns. They just sort of freak me out as, if overcooked, they can be really chewy. Its the texture I don’t always like but these prawns were really different. They didn’t have a big prawn-y taste like I thought they would, like the fish, it was much more meaty in texture and the taste was much more subtle than I thought it would be. If anything this trip to Fishers has taught me a lot about how good proper fresh fish can be and what it’s supposed to taste like! Definitely worth taking a trip to Fishers if you are visiting Edinburgh.